The following is a simple 3 column HTML page layout using CSS (no tables) so that the left and right “sidebars” have a fixed size and the content expands and contracts to fit the remaining page width. There are a couple of “tricks” to get this working. 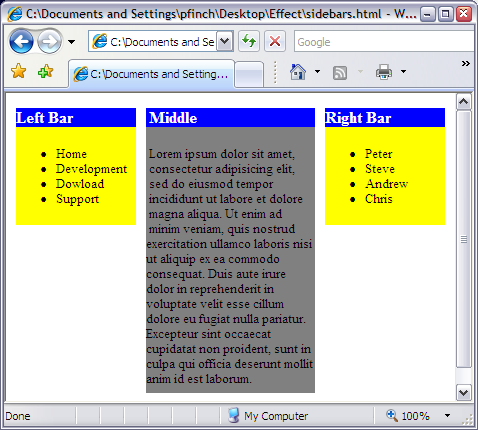 Use “float:left” and “float:right” to position the left and right sidebars. The “lbar” and “rbar” divisions MUST appear before the “middle” division. [Optional] Remove the margin from the h1 heading “margin:0” otherwise it looks odd on some browsers if it’s the first element in the division. I was trying to create a fixed button bar, at the top of the page, on Internet Explorer 7 using JQuery but I could not get the bar to stay at the top. The CSS property “position:fixed” lets you fix the location of a HTML element on a page so when the rest of the page is scrolled, using the scrollbars for example, the element stays in the same location in the browser window. I found that adding the following DOCTYPE to the top of the pages fixed the problem.